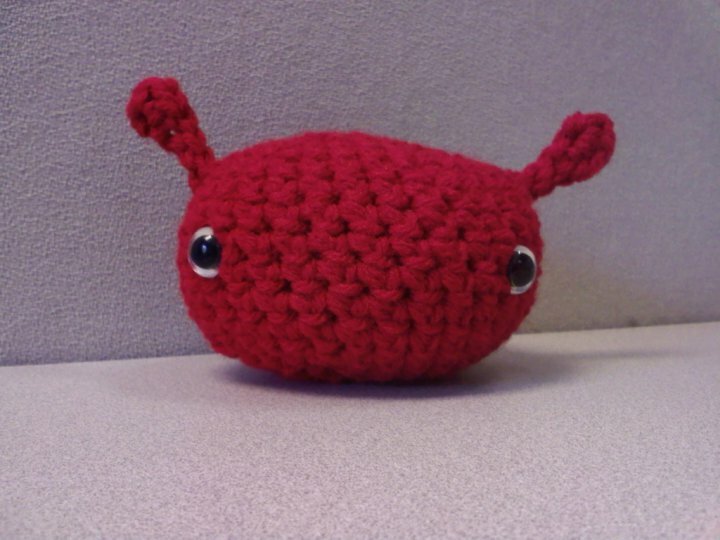 I belong to a group on Ravelry called Amigurumi Army which every month they have a theme crochet-a-long. This month was Outer Space. As I have posted before as this month has been VERY busy I picked a pattern that was simple and worked up in about an hour or so. This pattern by RoxyCraft had been sitting in my Ravelry queue since pretty much my joining day and I always love knocking that down . I give you The Gabu. I will have lots to post very soon for the swap projects (they are almost done) and for my future nephew in the making Hunter James. I would hate to ruin the surprise for my swap partners so I will wait till they are received, and the baby shower is coming so soon I will have those pictures too. This entry was posted in Experiment, raverly, Swaps. Bookmark the permalink. This is cool. Not sure if you know this ,with babies and children you can’t use though eyes, you need to crochet them. A baby and child could pull them off and eat them it will result in them choking. Keep us the good work. Love seeing what you are up too.